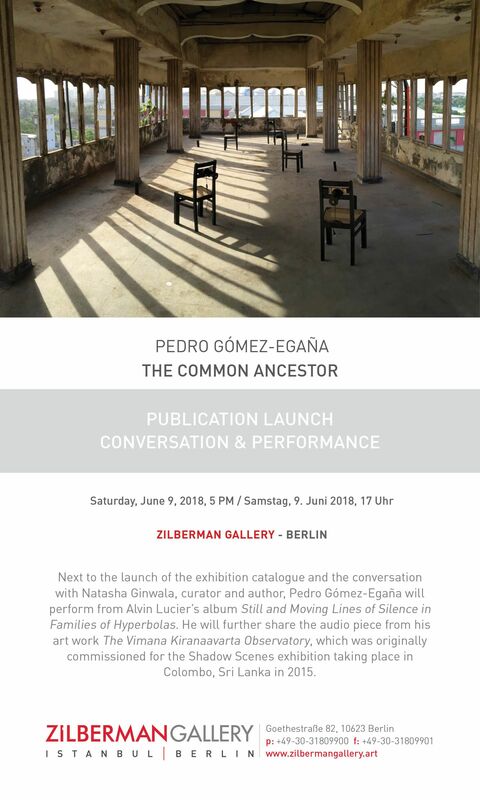 On the occasion of Pedro Gómez-Egaña’s exhibition The Common Ancestor, you are cordially invited to the publication launch, performance and conversation between curator and author Natasha Ginwala and the artist Pedro Gómez-Egaña. Gómez-Egaña will perform Alvin Lucier’s Still and Moving Lines of Silence in Families of Hyperbolas. He will further share the audio piece from his work The Vimana Kiranaavarta Observatory, which was originally commissioned for the exhibition Shadow Scenes taking place in Colombo, Sri Lanka in 2015. The exhibition catalogue contains texts by Aaron Schuster and Lotte Laub, and an interview by Natasha Ginwala. Natasha Ginwala is a curator and writer. She curated Contour Biennale 8, Polyphonic Worlds: Justice as Medium and was curatorial advisor for documenta 14, 2017. Other recent projects include Arrival, Incision. Indian Modernism as Peripatetic Itinerary in the framework of "Hello World. Revising a Collection" at Hamburger Bahnhof - Museum für Gegenwart, Berlin, 2018; Riots: Slow Cancellation of the Future at ifa Gallery Berlin and Stuttgart, 2018; My East is Your West at the 56th Venice Biennale, 2015; and Corruption: Everybody Knows... with e-flux, New York, 2015. Ginwala was a member of the artistic team for the 8th Berlin Biennale for Contemporary Art, 2014, and has co-curated The Museum of Rhythm, at Taipei Biennial 2012 and at ‪Muzeum Sztuki, Łódź, 2016–17. From 2013–15, in collaboration with Vivian Ziherl, she led the multi-part curatorial project Landings presented at various partner organisations. Ginwala writes on contemporary art and visual culture in various periodicals and has contributed to numerous publications. This spring she joins as curator at Martin-Gropius-Bau, Berlin.